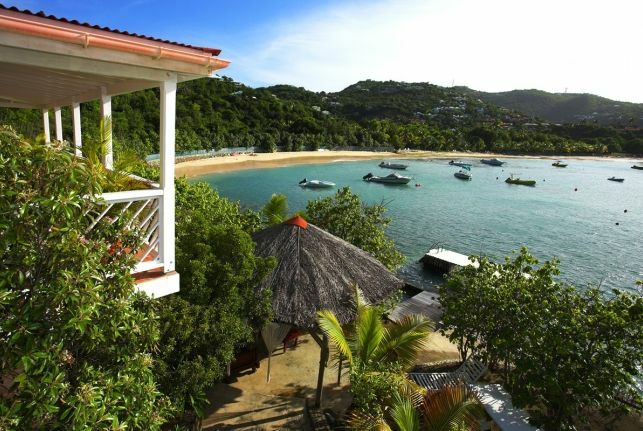 Villa Sous la Falaise (SOU) is nestled just above the water at the eastern end of St. Jean Beach, St Barts. Separate cottages offer a superb view of the beach and the Eden Rock Hotel. A stone path connects the individual bedroom cottages to the main living, dining and kitchen bungalow. The large pool is located below the bungalows and there is a BBQ area which is great for entertaining families or large groups. Within easy walking distance along the beach to shops and restaurants. Private, convenient, comfortable and the perfect vacation villa. BBQ, Blender, Coffee Maker, Dishwasher, Juicer, Microwave, Screens, Toaster. Gourmet kitchen with marble counter top, 2 refrigerators and a juicer. Open and airy on the covered terrace - takes in the views over St. Jean Bay and the Eden Rock. Ceiling Fan. Located in main bungalow. Very comfortable, it opens right up to St. Jean Bay. 1 King Bed, Air Conditioning, Ceiling Fan, Ensuite Bath. Has mosquito netting on the bed. French doors to terrace and ocean view. 1 King Bed, Air Conditioning, Ceiling Fan, Ensuite Bath. In separate bungalow. Has mosquito netting on the bed. French doors to terrace and ocean view. 1 King Bed, Air Conditioning, Ceiling Fan, Ensuite Bath. In separate bungalow furthest from the house with kitchenette. Has mosquito netting on the bed. French doors to terrace and ocean view. A covered terrace off the main bungalow. Each bedroom also has a private terrace. Tropical gardens line the pathways to the bedroom, which are in separate bungalows.